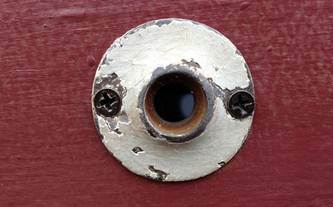 Peephole Cinema (http://www.peepholecinema.com/) is a small benevolent gesture, one which offers an element of surprise and delight to the public realm. It exists as a peephole; an alternative venue for art, which showcases experimental film in a publically accessible manner 24/7. The short films will be silent, experimental, and non-narrative. They will be looped and viewed 24 hours a day, 7 days a week. The ‘cinemas’ are made to be seen-one-person-at-a-time, reminiscent of the Edison’s Kinetoscope Parlors, the first early cinemas which were in existence on Market Street in 1895. We hope to challenge the idea that films must be viewed in a theater. The peephole cinema experience is a prototype. As far as we know, it is the first of its kind! Viewing films in a tiny hole allows for darkness required of film screening–which is why we don’t see a lot of public films. As an independent unsolicited act of generosity into the public realm, we feel that the spirit of the project is also important. We are also interested in fostering a felt sense of shared public spare, thereby encouraging connection within the community. Peephole Cinema is playful by nature. It acknowledges our voyeuristic pleasure and allows us to explore sense of curiosity.